Machined on the same machines that manufacture our barbells, each ring receives a handcrafted center knurl that is patterned after our power bars. Each ring is first machined to the desired diameter size, with a consistent band width of 9.5MM or 5.5MM. After the precision knurling is added by the machining department, the ring is then tumbled to remove any sharp points or edges, and finally polished to give it the stainless steel shine. Each ring box is hand formed in our press brake and laser cut with the Rogue Emblem (or Rogue Supply Emblem), then coated in our signature matte-black powder coat finish (or then sent along to the paint line to receive a Satin Clear (top) and Satin Black (bottom) finish. The interior cordura lining for the insert is then added by our skilled sewing department, creating a beautiful display piece. A unique collaboration between all of our manufacturing departments, the Rogue Knurled Ring is a genuine original—made from 316L stainless steel with a hand-crafted center knurl patterned after our power bars. 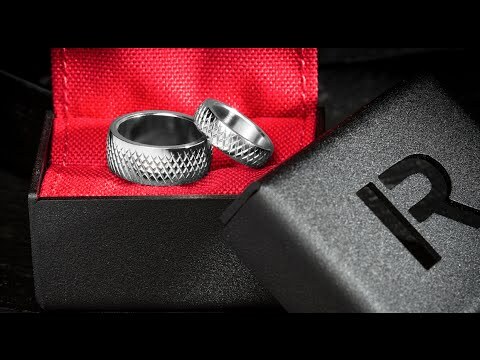 The ring is available in a wide range of sizes (fit for men and women), and is presented in an exclusive laser-cut ring box with your choice of Rogue "R" or the Deuce logo, along with a red cordura insert. The Rogue Knurled Ring was designed to serve as a one-of-a-kind wedding band, or as commemorative jewelry for any athlete or team with a like-minded passion for fitness and classic American craftsmanship. Each ring is first machined to the desired diameter (standard 4 - 13.5 sizes available), with band width options of 5.46MM and 9.53MM. After the precision knurling is added by the machining department, the ring is then tumbled to remove any sharp points or edges, and finally polished to give it the stainless steel shine. The ring boxes, meanwhile, are formed and Rogue-branded by our laser and press brake department, then sent along to the paint line to receive our signature, textured black powder coat finish, or a Satin Clear (top) and Satin Black (bottom) finish . The interior cordura lining for the insert is then added by our skilled sewing department, creating a beautiful display piece. Rogue Knurled Rings is rated 4.7 out of 5 by 27. Rated 5 out of 5 by Big J from Very appropriate My fiancé bought me this ring as my wedding ring because that's what I said I wanted. Fortunately it met my expectations and then some. Lifting has been my life for 18+ years and I couldn't think of a more appropriate accessory for myself. If there is one thing we argue about time and time again is who goes to the gym first and I feel this ring best represents me and my relationship. I feel that the ones who would best understand are the ones all about that gym life. The only down side is that the case almost outshines the ring. I wish I could take it everywhere just to show people. Overall I'd say this is a great unique product and a must have for gym rats. Rated 4 out of 5 by Lifeisjuicefromabox from Great ring Bought it as a wedding ring... great ring but I ended up having to buy another one because the fit is larger than expected. I was sized by a jewler before ordering and the ring that arrived to big. Rated 5 out of 5 by Cam02 from Great!! I love my ring! We just need a black version now! Make it happen Rogue! Rated 3 out of 5 by Mike in Denver from Great ring killed by sharp edges Would honestly be 5 starts. The outer edge of the inner ring needs to be rounded and polished for a way more comfortable feel. Wore the ring for a day and kept talking it off because it was so uncomfortable. I ended up breaking down and soothing and polishing it myself. For the price of the ring and the materials used to make it I'm actually kind of disappointed. This is pretty much a basic feature of every modern ring. After polishing it and smoothing the edges I've got no issues with it. Rated 5 out of 5 by stephaniemichelle12 from Gorgeous ring! I bought this ring about two weeks ago and it shipped the next day and I received it within three days. It is beautiful and the knurling feels exactly like a barbell. My fiance will love it as his wedding ring! Rated 5 out of 5 by Dedcakes from Great price,awesome with Matte finish I usually wear silicone rings but this one looked cool. I went for the MAN thicc boi size and I love it even though I have medium sized hands. I used the rough side of a sponge to give it a MATTE finish and I like it even more. Rated 5 out of 5 by BryanR from Awesome Ring! I bought this as my wedding ring and have no regrets! I do kind wish it came in black but either way it’s awesome and unique. Only been married a week and have gotten so many compliments on it! Rated 5 out of 5 by Fitover68 from wonderful birhday gift for wife Quality. Finish. And the box. Hey Rogue, I think that other USA manufactures need to recruit and hire your people. You have set the bar high for quality and you exceed it. Wonderful.